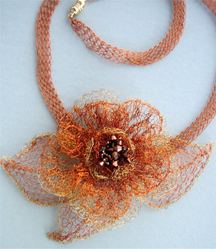 Layers of knit copper and brass wire petals, assorted beads, leaves, form another no wilt corsage suspended on a 20 inch knit copper tube “chain”. The closure is magnetic. Flower and leaves measure 5.5 inches at their widest axis. 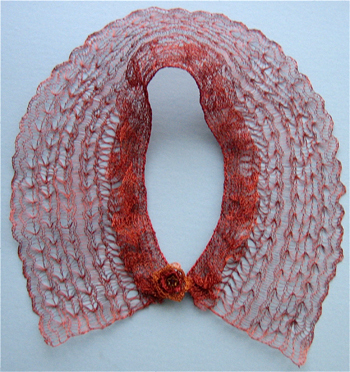 A new/different direction from other neck pieces, my first with a “story” open to interpretation; it is composed of coiled, knit, crocheted, and stitched telephone and magnet copper wire, assorted beads, a couple of acupuncture needle covers, the cut/ partially frayed “heart” of an unfinished spirit doll, and a screw closure. It is also considerably more of a “burden” than the feather weight magnet wire cousins, weighs in at 3.5 oz./88 gms. 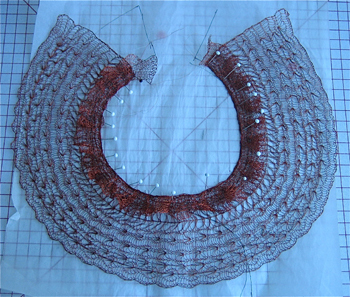 In anticipation of the fiber invitational in Lowell and the annual Art to Wear show at Cambridge Artists’ Cooperative, the copper wire is resurfacing in new neck pieces. Some of the presently completed work may be seen below. Materials often come with their own stories. I purchased my nearly invisible wires from an elderly gentleman at a RI yard sale years ago for only a few dollars. He in turn had worked using them on TV and radio tubes in the “old days”. The 32 gauge version was obtained with the assistance of a brother-in-law-electrician. 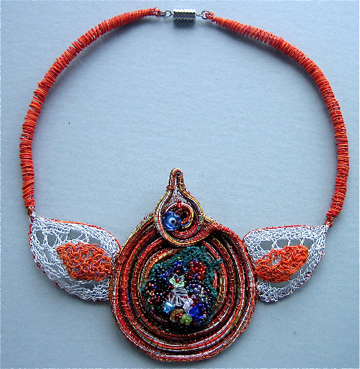 A beaded piece is “in the works”, and then there is all that colored telephone wire and a shoebox full of acupuncture needle cases periodically calling out to me… I tend to work freeform, without sketching, piecing elements and working out designs and problems as I go. 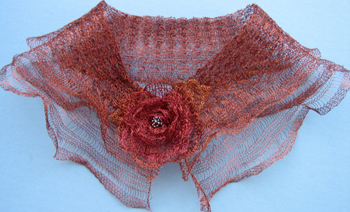 There are elements of surprise for me as well in each piece I create. Trying to coax a rectangle into a square. Blocking is one of those topics open to endless debate both as to method and necessity. In most of the items I produce using conventional yarns, I restrict it pretty much to washing/pressing/ironing as needed, thus avoiding all those blocking wires, pins etc. In this instance however, the wire item is in need of some help in changing into and retaining the desired shape: my partial solution is seen in the photo above. For the curious: Magnet wire or enamelled copper wire is a copper or aluminum wire covered with thin insulation. It is used in the construction of transformers,inductors, motors, headphones, loudspeakers, hard drive head positioners, potentiometers, and electromagnets, among other applications. However, it is not usually magnetic itself. Magnet wire insulating films used (in order of increasing temperature range) include polyurethane, polyamide, polyester, polyeseter-polyimide, polyamide-polyimide (or amide-imide), and polyimide. Kynar wire is an instance of color coated member of these families, and used in my “colored” jewelry items. For knitting on a loom I prefer 32 gauge or thinner (higher numbers), which can be plied successfully for more drape but are nearly invisible singly; 30 gauge or less(lower numbers) moves into the hand crochet/knit coil domain for me. I enjoy using materials designed for uses other than those for which they were designed, the inherent challenge, surprises, and problem solving. 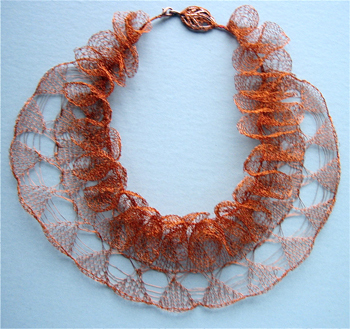 Posted on July 11, 2009 September 8, 2014 Categories Machine knitting (MK), Not Just Knitting, Wire JewelryTags Wire Jewelry, collars, copper wireLeave a comment on Trying to coax a rectangle into a square. In anticipation of participating in the Lowell show, and in the upcoming art to wear show at Cambridge Artists Cooperative in the fall, I have returned to fabricating wire collars. 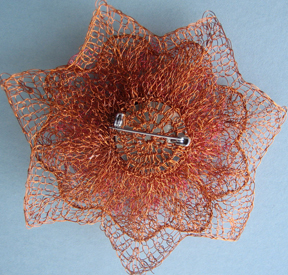 In writing updated artist statements I am again considering why fiber, certainly why wire. I continue to enjoy the surprise and problems in each new piece. Curiosity, exploring and experimentation temper the repetition of production. Monofilament, fishing lines, wire, have a mind and personality of their own at the opposite pole of friendly yarn such as standard gauge wool. Attempting to work with them and their in-betweens makes the playground that much larger. 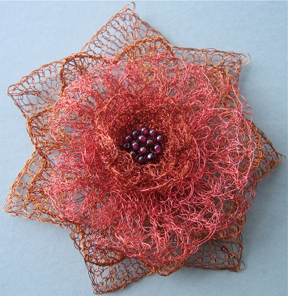 The oval “beads” consist wire crocheted over glass, the round one is coiled and stitched wire and beads.